Since the last version was 1.99, the next version will be 1.A0. This version has a new Beta version of grub4dos (not yet officially released) to which the developer yaya has kindly added some new features. We can now ask grub4dos to center the menu entries and the menu help text automatically. Revision 2 is now available. It has slightly more content, more pictures and hopefully less typos thanks to 'Glen'. If you had previously ordered the Easy2Boot 'Getting started with Easy2Boot' PDF from Payhip, then you should be able to use the download link in the email that you received to re-download the new revision 2 PDF. If not, then contact me. Just found this post on reddit about a new Hiren's type WinPE. It is not an official Hiren ISO but is made by a 'fan group' - see here for more info. There was a small bug in the grub4dos version of E2B v1.99, so I have updated the download with a new version of grub4dos (plus a few other very minor changes). v1.99 is not yet available on the E2B website, so only users who read this blog and have downloaded the old v1.99 will be affected. The \grldr file should be dated 2018-06-18 in the latest version of E2B v1.99. The small bug in the old grub4dos version was that the animated E2B icon could spontaneously disappear when using the menu cursor keys. Having trouble 'Safely Removing' USB Hard drives with the latest Windows 10? I have been using 'Disk Ejector' from QuickandEasySoftware (free). 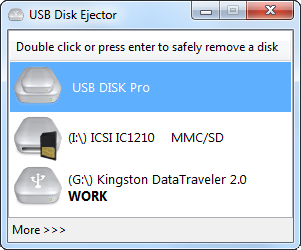 You can copy it to your Desktop or to the E2B USB drive. You can also try USB Safely Remove from http://safelyremove.com as an alternative. By using an XML file, we can automate the installation of Windows 10 in Easy2Boot. The XML file can have a preset or random UserName and ComputerName, or it can be configured to only have an Administrator account or to prompt for the User Name near the end of the installation process. For instance, an XML file for SDI_CHOCO could be picked by the user and a fully unattended and automated Windows 10 install would then proceed. However, it would be useful if we could use the same automated XML file each time we installed it to a different system, but could prompt for a different ComputerName and UserName before we started the installation. This allows us to get a cup of coffee whilst ten different systems are installing without having to come back and enter the UserName half-way through. See also this later blog post for automatically setting the Serial Number in the ComputerName based on the same method as used in this article. At last E2B v1.99 is now available! Note: I have just quickly updated the 2018-06-18 download to v1.99 2018-06-16 - the more recent version just has improved help in Make_E2B.exe, a small bugfix to grub4dos and a new sample mnu file added. Note: The new eBook is written for use with E2B v1.99. Also a Sample .mnu file Run_ISO_With_Alarm.mnu added (sounds an alarm before running ISO) has been added. PimpMyDrive.cmd now adds a 'Play a tune' menu to the Main menu. Alarm.g4b added to \_ISO\e2b\grub folder so just issuing the command 'alarm' will sound an alarm. This is probably the last Beta before release as E2B v1.99 full release, so let me know if you find any issues. As before, if you have animated graphics displaying and you also simultaneously play a tune, the tune may play slower than it should unless you stop the animation (press F2 to toggle animation on and off). Any key press will stop the tune from playing. Download from Alternate Download areas or direct link here.